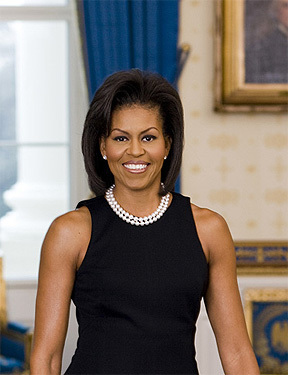 Official White House Portrait for Michelle Obama released February 27, 2009. Zoom in to shoulders for for Michelle Obama's official White House portrait released Friday. 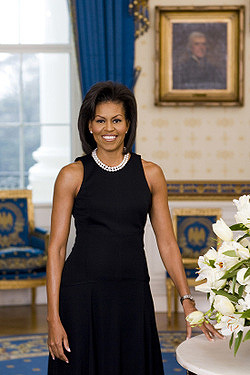 After her appearance in the State of Union address in February, the cover Vogue magazine in March, a People Magazine interview, and showing bare arms in the official White House portrait; the upper arms of Michelle Obama, 44, are the buzz. The chic dress in the official White House portrait was designed by Project Runway judge Michael Kors and the picture was taken in the Blue Room of 1600 Pennsylvania Avenue by White House photographer Joyce N. Boghosian. Some say that because the State of the Union Address was formal and the season was winter, a sleeveless dress showing her arms was out of place. Reaction also ranges from “good for her for showing off her assets” to “who cares … we have much bigger problems to worry about.” It’s too early to gauge the reaction to the official photograph. Michelle Obama has said she exercises in 90-minute workout three times a week with a personal trainer and told People magazine that during an average day in the White House, she and President Barack Obama get up about 5:30 a.m. and usually work out and have breakfast. A friend Sandy Matthews, an executive at a children’s advocacy firm in Chicago who used to work out with Michelle in early morning workouts, reports that the first lady is a fan of cross-training, a mix of strength and cardio exercises usually involving weights, the treadmill, the stair-stepper or a spin bike.